CESAR researchers have also been involved in training a new generation of scientists and engineers in energy systems analysis and modelling. In the fall of 2017, 48 students registered in Scie529, the capstone course for the energy specialization at the University of Calgary. They worked in interdisciplinary teams to explore 10 different energy future scenarios. Their work, along with research by CESAR staff and graduate students, culminated in a poster session in downtown Calgary that attracted close to 100 representatives from industry, government, non-governmental and academia. Mark Lowey from EnviroLine, who is a communications advisor to CESAR, was there and wrote about the special event. I asked him to share that report with us in two CESAR blogs; this is the first. University of Calgary students presented their studies on potential pathways to reduce Canada’s greenhouse gas emissions to close to 100 people from industry, government, non-governmental organizations and academia at a special event in Calgary. 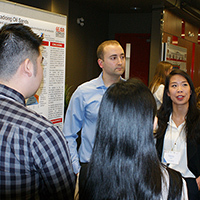 Forty-eight students showcased their research posters at UCalgary’s Downtown Campus in December 2017, in the fourth annual event, titled “Pathways to Sustainability: Canada’s Energy Future.” The by-invitation event was organized by Canadian Energy Systems Analysis Research (CESAR) Initiative and jointly sponsored by UCalgary. “These students have been doing exploratory studies, assessing how particular combinations of technology, infrastructure and behavioural changes could contribute to a credible, compelling pathway that will help Canada make its greenhouse gas commitments,” David Layzell, course coordinator/instructor, professor and CESAR’s director, said at the event. Data resources for the student projects were contributed by CESAR using, in many cases, data extracted from CanESS (Canadian Energy Systems Simulator), a technology-rich, economy-wide energy systems model developed by whatIf? Technologies Inc. in Ottawa. The natural science, business and engineering students, in their final year of undergraduate studies, are enrolled in the Scie529 capstone project course in sustainable energy, environment and economy – part of the Energy Sciences Concentration in the Natural Sciences Program in the Faculty of Science at the University of Calgary. Want to see the posters presented at the CESAR event? adopting heat pumps in Ontario’s residential sector. Along with the 10 posters presented by undergraduates, CESAR staff and graduate students presented an additional 10 posters. Many of these focused on CESAR’s Pathways Project, which is looking at all sectors of the economy and all provinces in Canada forward to 2060, to identify pathways that could help Canada meet its climate change commitments. “We’re excited to say there’s a rapidly growing interest across Canada in CESAR’s Pathways Project and in the tools we’re developing to make it happen,” Layzell said. Canada has committed to reduce national greenhouse gas emissions by 30 per cent by 2030 and about 80 per cent by 2050, while simultaneously growing the population and the economy. However, we have seen these kinds of transformational changes in other technologies and sectors of the economy in the past 20 to 30 years, he added. Innovations in digital technologies have disrupted major industries, including photography, music, video/movie, books, news media, telecommunications and banking. Many innovative technologies are entering the marketplace, such as autonomous and electric vehicles, and lower-cost technologies for solar power and electricity storage. These technologies are often coupled with new business models for delivering energy services, such as car sharing, cogeneration, or ‘prosumers’ – producers and consumers of electricity – that are creating distributed energy systems. Layzell said a key question from a climate change perspective that CESAR’s Pathways Project is exploring is: What disruptive technologies or business models have the potential for success, and which ones will align with Canada’s greenhouse gas emissions and emissions commitments? Another key question is: How could transformative or even disruptive technological, business or social innovation be directed to address societal goals (including, but not limited to GHG-emissions reduction)? CESAR plans a series of publications on the results of its analysis and work, which is supported by the Edmonton Community Foundation and the National Energy Board (NEB). Albert Louie, director of energy markets at the NEB, told event participants that the national energy regulator has been working with CESAR on the Pathways Project to learn about the current and future policy directions that different jurisdictions are looking at, and the implications for the rest of the country. “We’re very pleased with the consultations” led by CESAR, which “will continue to inform our work,” he said. The NEB also does energy modelling analysis and data visualizations, and provides hydrocarbons assessment, renewable energy and technologies analysis, and pipeline information. The NEB produces weekly market reports and snapshots. The regulator’s Canada’s Energy Futures project is the main forward-projecting model of energy supply and demand to 2040; it was recently updated and released in October 2017. “It included two ground-breaking scenarios, one on a higher carbon price and another on high-technology/high renewables adoption,” Louie said. “It really speaks to how we think about our academic plan, how we think about our research plan, and how we are trying to build connections with our community,” she said. The students were excited to show off their research to members from the community, says mechanical engineering student Nicole Belanger, a member of a team that explored the role of biochar and agriculture in reducing carbon emissions. “We felt that it was a fantastic opportunity to connect students with industry, as well as bring attention to the great research CESAR has done in low-carbon energy,” she says. Mechanical engineering student Eric Patterson, on a team that investigated the potential for rooftop solar energy in Alberta, says the students benefitted a lot from the downtown poster session. The second blog in this series will take a look at some of the student team projects and responses from experts in the community.